I was quite surprised to see how diverse Gran Canaria actually is - I'm embarrassed to admit this but I hadn't realised how mountainous the island is as I'd mainly just seen photos of the beaches before :p We attended an all-day island tour and it was quite possibly my favourite part of the holiday - I loved seeing different places on the island. Some of the really inland areas actually reminded me of Finland a bit, what with all the pine trees and rugged landscape! There are a LOT of photos from my holiday here if you want to take a look. Gran Canaria is the second most populous island of the Canary Islands, a Spanish archipelago, with a population of 838,397 which constitutes approximately 40% of the population of the archipelago. Located in the Atlantic Ocean about 150 kilometres off the northwestern coast of Africa and about 1,350 km from Europe. 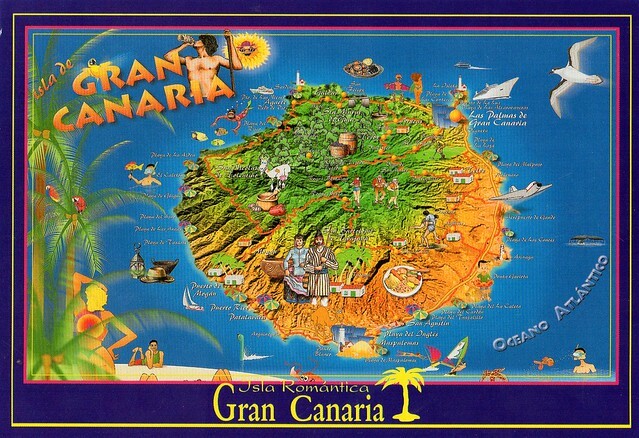 Gran Canaria was populated by the Canarii, who may have arrived as early as 500 BC. The Canarii called the island Tamarán or Land of the Brave. After over a century of European (French, Portuguese...) incursions and attempts at conquest, the island was conquered on April 29, 1483, after a campaign that lasted five years, by the Crown of Castile, with the support of Queen Isabella I, a conquest which turned out to be an important step towards the expansion of the unified Spain. Gran Canaria is located southeast of Tenerife and west of Fuerteventura. The island is of volcanic origin, mostly made of fissure vents. Gran Canaria's surface area is 1,560 km² and its maximum elevation is 1,949 meters (Pico de Las Nieves). It has a round shape, with a diameter of approximately 50 km. Gran Canaria is noted for its rich variety of microclimates. Generally speaking though, the average daytime high ranges from 20 °C in winter, to 26 °C in summer. Some cool nights occur in winter, but lows below 10 °C are unknown near the coast. Inland the climate is still mild but mountainous areas see the occasional frost or snow. Annual rainfall averages 228 mm, most of this falling in the cooler months, with July, August and September normally rainless. Rainfall is unevenly distributed through the island with some areas being much drier than others. Cloud cover and sunshine is often quite variable during the cooler months, and there can be several rather cloudy days at times in winter. Summers are generally quite sunny however, with the south of the island being most favoured. The number of annual visitors is 2.2 million. Most of the tourists visit the southern part of the island. The north tends to be cooler, while the south is warmer and sunny. The east coast of the island is flat, dotted with beaches, while the western coast is rockier and mountainous.